The only modern smartphone you can (truly) own. To many in the world, modern smartphones have become the single most significant piece of technology in their lives, a gateway to the world and representing your digital life. This comes at a price however: the tech industry have progressively turned you into the product or entrapped you into constantly buying new hardware. They design phones with services and apps that track and analyze your habits, your friends and acquaintances, and then exploit that information. We believe phones should not track you nor exploit your digital life. The Librem 5 represents the opportunity for you to take back control and protect your private information, your digital life through free and open source software, open governance, and transparency. The Librem 5 is a phone built on PureOS, a fully free, ethical and open-source operating system that is not based on Android or iOS (learn more about why this is important). We have successfully crossed our crowdfunding goals and will be delivering on our promise. The Librem 5’s hardware and software development is advancing at a steady pace, and is scheduled for an initial release in Q3 2019. You can preorder the phone at $649 until shipping begins and regular pricing comes into effect. Kits with an external monitor, keyboard and mouse, are also available for preorder. Not convinced yet? Read more below. Today, the news are filled with articles that show how tech companies are exploiting your data and weaponizing it. By purchasing a Librem 5 phone you are supporting a future of digital privacy, invested in supporting an open, community-driven environment. Vote with your wallet to support a future safe from digital exploitation and create a secure and respectful environment for you, your children and society as a whole. This device is for anybody and everybody interested in protecting his/her data, communicating privately to your loved ones, or supporting a future of protecting your digital rights. Parents will love the Librem 5 because it will allow them to communicate with their child, while having peace of mind that they are not being compromised or tracked without their permission. Developers will love the Librem 5 because it will allow them to control their software and the freedom to really own the hardware they rightfully purchased. Enterprises, Businesses and organizations of all sizes will love the Librem 5 because it will allow them to have a security focused phone that is immune to common threats and protects their intellectual property and sensitive data by default. CTOs/CIOs/IT and technology enthusiasts in general will love the Librem 5 because all the source code is available for audit, and they can tightly integrate whatever configuration the corporation requires. 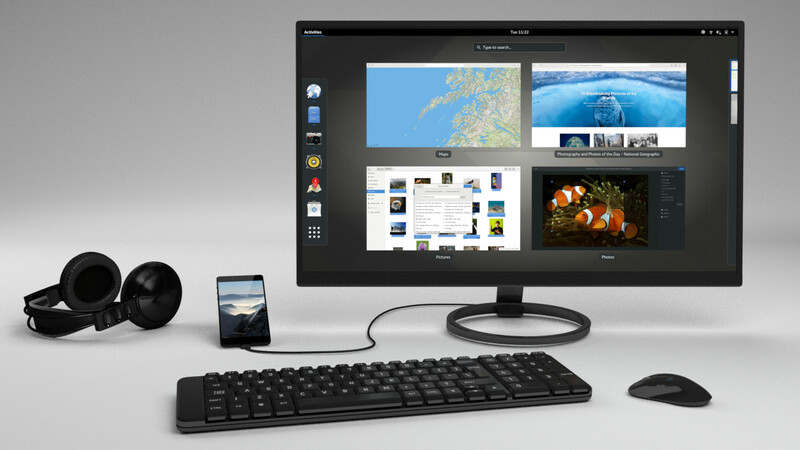 Interested in a kit containing the Librem 5 phone with a keyboard, mouse and monitor? Check out the 24″ bundle and the 30″ bundle. The Librem 5 will not wholesale gather your data for profit. It will not lock you into an ecosystem that controls you. It will not require you to enter banking details to simply get an app from an app store. Privacy protection by default, instead your profile and data being products sold to the highest bidder. Does not use Android or iOS. The Librem 5 comes with the mobile version of our FSF-endorsed operating system PureOS by default, and is expected to be able to run most GNU+Linux distributions. CPU separate from baseband, isolating the blackbox that the modem may represent and allowing us to seek hardware certification of the main board by the Free Software Foundation. Hardware Kill Switches for camera, microphone, WiFi/Bluetooth, and baseband. End-to-end encrypted decentralized communications via Matrix over the Internet. We also intend the Librem 5 to integrate with the Librem Key security token in the future. Put an end to planned obsolescence. With the industry’s obsession about thinness and “disposable” devices, the majority of phones manufactured in recent years embed the battery as non-replaceable part of the phone, typically soldered directly onto the motherboard. The problem is, all batteries age and wear with use, and after a few years no longer hold the charge. Devices with non-user replaceable batteries therefore become expensive paperweights destined for the garbage dump. We believe that you should be able to use your phone as long as you want to. That’s why the Librem 5 will include non-soldered, easily serviceable batteries that you can order. Keep your phone as long as you want, save money and help the planet. Unlike the rest of the industry indulging in fads and forcefully replacing the most standard audio connector to gain “control of the accessories market” and in a me-too pursuit of extreme phone thinness that nobody asked for, we care about your phone working with any headphone or line out without needing you to carry and keep track of yet another adapter dongle that can be lost or found to be incompatible. We have no intention of doing vendor lock-in, and so the Librem 5 comes with a standard 3.5mm headphone jack. The Courage Jack. Other mobile platforms typically keep you running on a “purchasing treadmill” of planned obsolescence, with vendors either stopping security and feature updates altogether after a few months, or providing bloated updates that slow down your device to the point of “software disenchantment“. Those short-term oriented business models force you to buy a new phone every few years to stay safe or enjoy decent performance out of your hardware. In contrast, the updates we provide to you through PureOS are meant to be in your best interests. When you purchase a Librem 5, you can be confident that we will continue to provide security updates, privacy improvements, bug fixes, and new features… for the lifetime of your device, without compromising performance. Your Librem will stay secure and responsive for years to come. Like a good wine, it will probably get better over time, not worse. Upon initial shipment of the Librem 5 in 2019, it will offer the essentials: phone functionality, email, messaging, voice, camera, browsing. The featureset will expand after shipment and over time to more free software applications. Your user experience will improve as we incrementally add commonly requested applications and features (such as calendaring, notes, calculator, PDF viewer, etc.) while keeping performance in mind. How can this be possible? Read more about our choice of PureOS for mobile. In addition to its high-performance and tightly integrated “native” applications, the Librem 5 phone will be able to run HTML5 (web) applications, which means common applications you use everyday will be available through the web browser. We plan to sandbox and isolate these applications from the OS, so the applications will not be able to have visibility into other running applications or have access to areas that you do not explicitly allow. 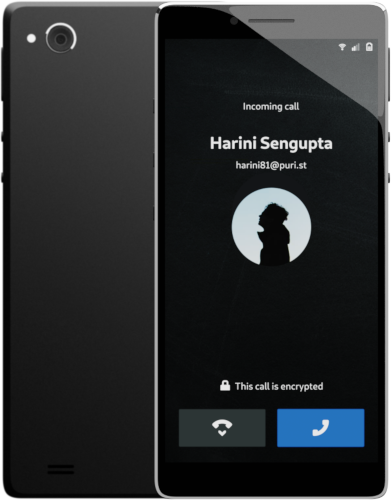 The Librem 5 will be the first ever Matrix-powered smartphone, natively using end-to-end encrypted decentralised communication in its dialer and messaging app. Matrix is an open ecosystem for interoperable encrypted communication, supporting a rapidly growing community of over 2 million users for VoIP and Slack-style messaging. Allowing you to easily communicate securely to any Internet connected device, including iOS, Android, Windows, OSX, or GNU+Linux machines. 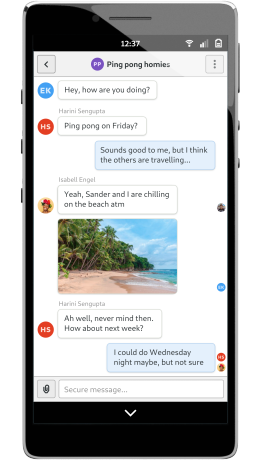 Having a native communication suite which allows for Calling, Text Messaging, Group Messaging, and Video Calling is the future of communication. Purism has built and delivered laptops successfully for many years and is now using that knowledge in developing its phone product. We have assembled a world-class team, in over 15 countries, united in one common goal to make computing devices that respect digital rights. We have specialties that include mobile development, mobile communications, hardware manufacturing, software security, privacy protection, and free software. We are passionately devoted to security, privacy, and digital rights for users, and this shows clearly in all our products. By creating a phone that supports an open community-driven development environment, we can change the future of computing to be respectful of your digital life. You can follow status updates on our blog with posts that have the “phones” tag (see the news page for more options). This page serves as a broad overview of the principles behind the Librem 5; you certainly now have a lot of questions on your mind regarding the Librem 5 and how it fits your technological and ethical requirements. Please check out the Librem 5 section of our FAQ page for answers to the most commonly asked questions! 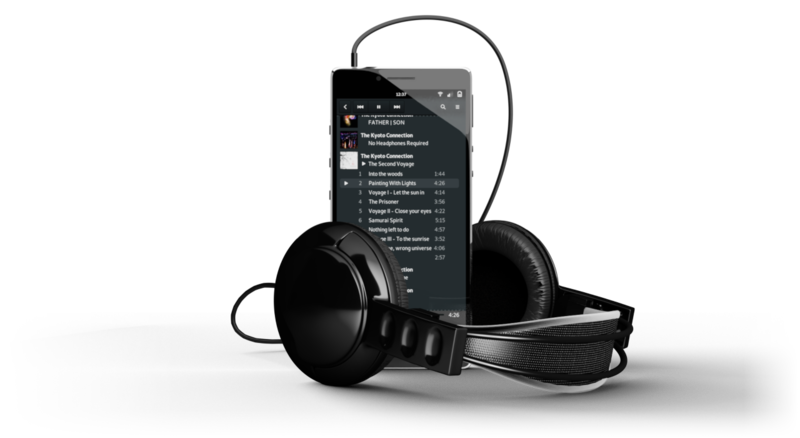 If you are a developer interested in getting involved, we encourage you to participate (whether directly or indirectly) in mobile development with the Librem 5 platform. See our developer documentation page to get started. Note: final product specifications and appearance may not be exactly as shown. 3D renders and user interface designs are artist renderings, for illustration purposes. Images and specifications are subject to change depending on manufacturing requirements. Want to get announcements & news digests once in a while? You will receive an automated e-mail you will need to reply to to confirm your subscription. 3D renders are artist renderings, for illustration purposes. Images and specifications are subject to change depending on manufacturing requirements. Unless otherwise noted, contents created by the Purism team on this website are copyleft with a CC-by-SA 4.0 license.